Doha, 09 February 2017: Simaisma Resort, Qatar’s undiscovered oceanfront oasis, celebrated its first anniversary, since the 5-star hotel welcomed its first guest in February 2016. The celebration welcomed the hotel loyal guests, business partners, and media. Simaisma, a Murwab Resort, celebrated the occasion with a distinctive event hosted by the resort’s General Manager Mr. Tarek Nour, where guests and members of the media had an updates tour of the resort’s luxurious villas, and its myriad of recreational facilities. The event continued with a lunch reception that took the guests on a meticulous culinary journey at Awtar the resort’s all-day dining restaurant where their palates were introduced to some of their signature dishes and the rich range of scrumptious flavors that Simaisma has to offer. 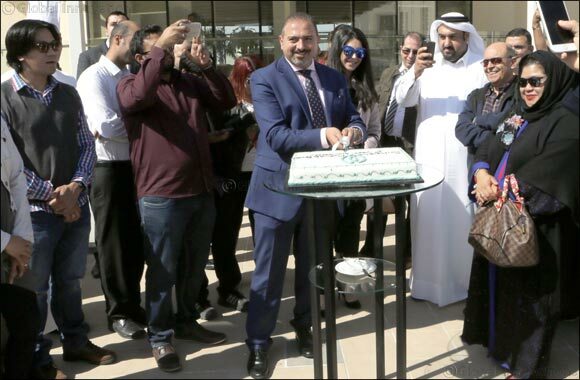 In celebration of their first anniversary, Tarek Nour, General Manager of Simaisma, said: “It is my pleasure to celebrate this important day with the Ladies and Gentlemen of Simaisma, our esteemed guests and respected members of the media. Though still at our onset, the excellence and true dedication of our people has been instrumental in realizing our vision for Simaisma as a five-star resort that personifies the true meaning of luxury and privacy”. “At Simaisma, we offer families in Qatar a chance to go on a private escape, designed to mesmerize both the heart and the soul and reinvigorate them with grandeur and glamor. Having successfully set a benchmark for ‘five-star resort living’ in the country, we have no plans to stop here, as we intend to raise the bar of service excellence to exceed the expectations of today’s sophisticated local vacationers and international travelers alike. Which is why, as a special ‘thank you’ to our guests, whose endorsement and avid reviews helped us earn such a sought-after reputation, we have in view a few surprises and a wide range of amazing new offers and competitive prices for Simaisma visitors and clients in 2017”, he added. In just one year, Simaisma Resort, has emerged as the destination of choice for an uninterrupted time with the family away from the city’s bustling chatter, thanks to the resort’s elegant blend of the oceanfront oasis’s natural habitat with locally-inspired modern day amenities; a unique experience made complete with a selection of dining options and a multitude of indoor and outdoor facilities. The enchanting resort, which offers visitors a great deal of lavish suites and 52-spacious villas that feature a spectacular array of custom furnishings and personalized amenities, access to swimming pools, a basketball court, a tennis gym, fitness gym, kids playground, and an outdoor Water Sports Center, brings the concept of ‘five-Star resort living’ to Qatar’s hotel landscape for the first time. To make for a truly blissful escape away from city life, Simaisma indoor and outdoor dining venues offer visitors an exciting gastronomic adventure designed to cater to ‘everything palette’. From sophisticated fine dining to casual poolside fare, each and every dish is prepared fresh with local ingredients, cultivating the diners’ senses with flavor. Simaisma Resort offers a tranquil environment and its unique blend of luxury and privacy have been met with great acclaim from guests and business partners. The luxury resort took home the coveted title of ‘Qatar's Leading Villa Resort 2016’ at the World Travel Awards. Likewise, the resort achieved an outstanding ‘8.2 out of 10’ rating at Booking.com’s 2016 Guest Review Awards. The Resort success in its first year had set and setting the stage for an even bigger and better year for the luxury resort’s visitors and guests in 2017.